I know. That pun was as lazy as the plot line. 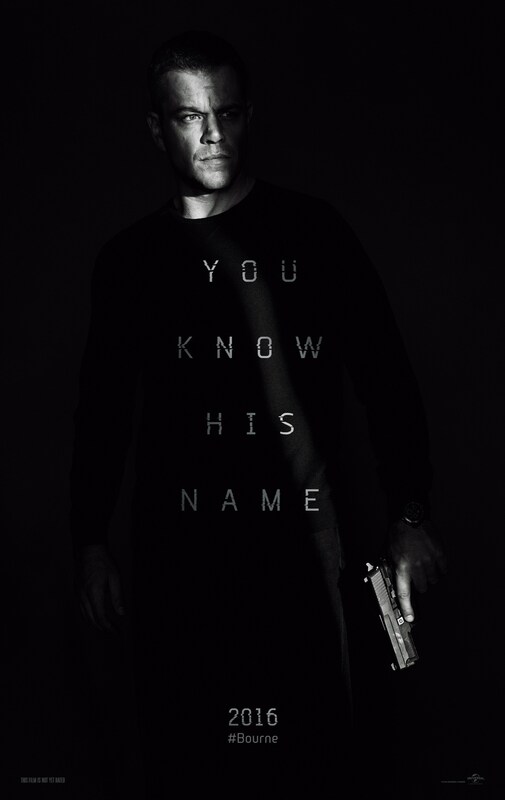 Bourne is back but bigger and better? Not even close. Blander and boring. Definitely. That synopsis failed to deliver anything that I’d hoped. I loved the Bourne series. Not quite up to the ridiculous hype BUT intricate adrenaline pumped little thrillers that (very) loosely adapted a bestselling Robert Ludlum franchise and took it in a completely different direction. When I heard that Matttttt Damonnnnnnn and Paul Greengrass were to reunite for a fourth outing after the misfire that was The Bourne Legacy, I was elated. Ultimatum left such an open ending that resolved the story arc for the trilogy BUT suggested an opportunity for his return. After watching this, I really think he should have kept swimming. A promising opening, with a dishevelled (and hench) looking Bourne knocking people out with one punch, soon simmered into a snoozefest. 20 minutes of mindless computer jargon, lazy references to Edward Snowden and a lot of flicking about with Alicia Vikander’s (Ex Machina) analyst hacking in Langley to Julia Stile’s (10 Things I Hate About You) hacking in Iceland and our main man . . . battling night terrors. What infuriated me the most was that despite Bourne supposedly remembering everything, he seemed even more disoriented and out of it than the other movies combined. The repetitive flashbacks unearthed a little more into his past BUT the revelations were hardly shocking and so predictable that it brought nothing to the mix. Stiles’ character was completely wasted and nothing more than a mere plot device to spur our troubled ex-CIA asset. Some mumbo jumbo about another Treadstone programme in the pipeline which even our own hero asked in one scene; “What that has to do with me?” And by the end, I wondered the exact same thing. Tommy Lee Jones’ CIA Director Robert Dewey should have been the game changer. A turning point after FOUR movies of seeking answers and closure for Bourne. Nope. He did his best with the role BUT his character was too busy meddling in some feeble and uninteresting subplot with social media mogul Aaron Kalloor (Riz Ahmed – Four Lions). Ahmed delivered a convincing accent BUT his character was far too weak and frankly unnecessary by the closing act. His moral and ethical conflict tied in with the increasing pressure from Dewey’s interference had potential BUT went nowhere. The film really did go through the motions. Teasing Bourne’s introduction then holding him back in multiple (and brilliantly shot) locations and forcing us to drudge through dull exposition with a group of generic and stocky CIA types that literally did the exact same thing as the other films. Alicia Vikander played the ambitious operative well BUT her attempts to try and bring Bourne back in from the cold to add as a feather on her cap could have been so much more. She got pushed into the background far too much. Quickly thrown back in for the final act. Shame. Vincent Cassel’s (Black Swan) bloodthirsty mercenary was the only interesting addition. He literally shot anyone in his path to pursue Bourne. His ruthlessness revealing an ulterior motive that was much more than securing a contract killing. The set pieces were the only things that kept me awake. Barry Ackroyd’s cinematography beautifully captured the chaos; especially during a violent street riot in Athens. The frantic shaky handy cam shots combined with David Buckley and John Powell’s thrilling movie score certainly ticked the boxes. BUT after a while, even the chases seemed drawn out and repetitive with Bourne bludgeoning people and causing carnage with no remorse or second thought. And if it wasn’t him, there were random people creeping out of the woodwork ready to throw a few flying fists here and there. The Vegas police car chase was probably the best sequence of the film. It was brutal, frenetic and nail biting. All that meandering for an explosive finale. All a case of too little, too late. Two hours of patchy pacing that retreaded all the story lines of the other movies with Bourne failing to remember and the CIA going out of their way to remove his presence. I actually preferred the Bourne Legacy. Jeremy Renner was a likeable lead and at least the hokey super soldier subplot was different. I don’t think it was even that vital for newcomers to bother watching the other movies. This latest outing was like the protagonist; cold, befuddled, isolated and tired. Even when that iconic Moby track rung through the cinema speakers, I couldn’t help BUT feel deflated and disappointed. I think Bourne should stay in hiding for the foreseeable future.